This time next week I will be in Germany! I'm really excited and also freaked out about it all at the same time. I'm doing little things like breaking in my shoes and triple checking everything to make myself feel better. If you have any tips about Munich, Verona, Florence, or Rome, hook me up in the comments below. I don't leave till Thursday night, so there may or may not be a Roundup next week. My friend Kate has kindly agreed to post things I have pre-written, so there will be new posts every day. 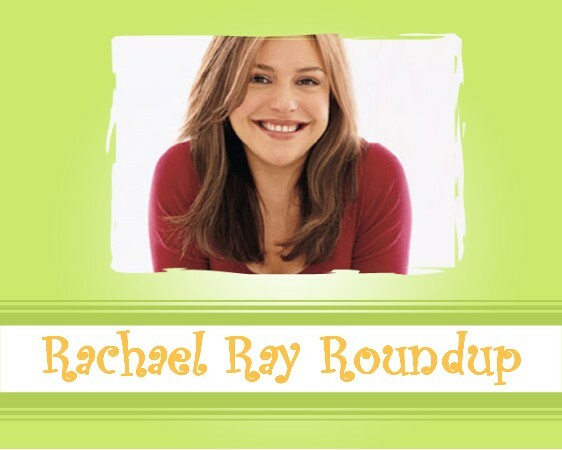 Here's what the blogosphere is saying about Rachael Ray this week. If you write a post about Rachael or see one that would be perfect for the Roundup, please e-mail me so I can include it! Happy Friday and Happy St. Patrick's Day. Talk Show Ratings Update: Broadcasting & Cable says that Rachael Ray's talk show ratings are "rising like a souffle." The show "served up the highest February sweeps ratings of any rookie talker since Dr. Phil started doling out onscreen advice in 2003." Specifically, "Ray's ratings were up 14% from the November sweep to a 2.4." The show "is the top-rated syndicated rookie by a wide margin." Speaking of Rachael's talk show, she was nominated for seven Daytime Emmys and appeared on CNN's Robin & Company to talk about this achievement. Inside Cable News posted a transcript of her appearance. Jessica at Jessica in Jerusalem participated in a Rachael Ray Shabbat, where each person who came to dinner brought a different Rachael Ray recipe. Sounds like it was a success. Slashfood featured Rachael Ray's Veggie Meals as its cookbook of the day. It also discussed Rachael's new deal with Dunkin' Donuts and got a crazy amount of comments on it (150 when I went by!). Stir Crazy offers a simple Rachael Ray recipe for mussels for a weekday dinner. Kalyn wrote a post this week over at BlogHer about Mimi's Bisquick Day, a protest against food snobbery and a defense of Rachael Ray all in one. I'm going to need to participate next time. I already know what I would make: Rachael's Rosemary and Ham Scones with some cheddar thrown in too. Shelterrific tried out Rachael's recipe for Irish Rice Pudding from Every Day with Rachael Ray. She wasn't wowed. Karen Gutierrez at CincyMoms tried Tomato, Mozzarella and Basil skewers, which were based on a Rachael Ray recipe. They were a hit. Claire at Culinary Colorado included Rachael's recipe for her Mom's 15-Minute Tomato and Bean Soup in a weeknight menu for company. You can find the recipe in 2, 4, 6, 8: Great Meals for Couples or Crowds. Iris of Out Loud is a fan of the Gabbybaby T-shirts featured on Rachael Ray's talk show recently. They are pretty darn cute. Someone should forward that to RR's show! What a CUTE baby! That baby is adorable! and totally captivated by RR. Perfect friday viewing, I think. What a cutie.